This may seem overwhelming at first, but really you only need to find 10 recipes that you like and can make well. Thats really all that most families and individuals use. If you rotate only two or three dinner recipes, you are going to get burnt out on the program really fast. Try a few new recipes each week and build your portfolio of alkalizing meals until you have 10 meals that you and your family love to eat. Look over the list of alkalizing foods, and take note of which foods that you and your family already enjoy. Then try to find more recipes that incorporate those tastes and textures. This will be much easier and enjoyable for your family to adapt to if you start off with foods they already like, than all of a sudden introducing tofu, kale and dandelion root. One of the first recipes you should try is an alkalizing broth. There are many variations but basically the broth is made from alkalizing vegetables and distilled water. The broth has a lot of necessary minerals and can help restore pH balance to your body. It promotes internal cleansing of all of the tissues and organs of the body. This broth can be used as a basis for more complex soups, or it can be served as a first course before any meal. Many fans of the pH miracle diet rely on juices to help cleanse their bodies of excess acidity. There are many popular juice recipes and they would be a good addition to your new way of eating. The juices can be consumed as a quick breakfast or a snack sometime throughout the day. Most can be made in a blender, so you dont need a fancy juicer. If you have children at home, you may be worried about finding recipes that they will love. There are many childrens vegetarian cookbooks that can be adapted for the alkaline diet by substituting certain vegetables. A lot of tasty fruits like apples, raspberries and strawberries are on the alkaline list. Sweet potatoes, which are a favorite of many children once they try them, are highly alkalizing foods and are good for the winter months. In the summer time, celery and other fresh veggies are a great snack and can be dipped in homemade hummus or a dip made from mayonnaise and lemon juice. 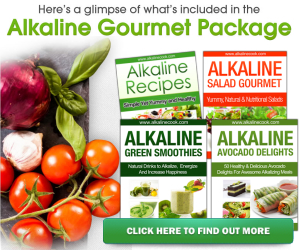 With a little practice and research, making alkalizing meals will become second nature to you and your family.